Motohakone (元箱根) is Onsen Town located right next to Lake Ashi. It is one of the popular tourist spot in Hakone. There are lots of the attraction with Lake Ashi, especially sightseeing cruise is very famous. Motohakone was used to be the Hakone Sekisho, the check point, of Tokaido. There is a ruins of Sekisho and the Cedar avenue on Tokaido has not changed since Edo Period. There is parking in this area. The Hakone Checkpoint, sekisho, was opened in 1619, shortly after the establishment of the Edo Government. Throughout the Edo period it was used to impose extremely tight controls on the passage of travelers, particularly women attempting leaving Edo. The checkpoint was closed down in 1869. After a break of 140 years, the checkpoint was reconstructed in the spring of 2007 as a museum. 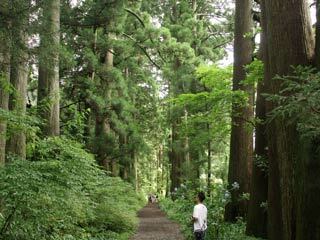 A section of path alongside Lake Ashi featuring over 400 cedar trees of more that 350 years old. The look of the cedar avenue has not changed since Edo Period, therefore you can feel the same atmosphere of Edo Period. ... is the largest lake in Kanagawa. The altitude of the lake is 720m from the sea level. From the Motohakone side, you can see beautiful Mt. Fuji through Lk. Ashi.